Background: Nanoparticles (NPs) suffer from rapid clearance from body and require frequent dosing if long treatment is required. Method: In order to solve this problem for solid lipid nanoparticles (SLN) and prolong their action, SLNs were incorporated into thermo-responsive Poloxamer sol-gels and their fate was investigated invivo and in-vitro using a near infrared lipophilic fluorescent dye; dialkylcarbocyanin . Leakage test, release of intact SLNs from sol-gel and SLN size and zeta potential were investigated. 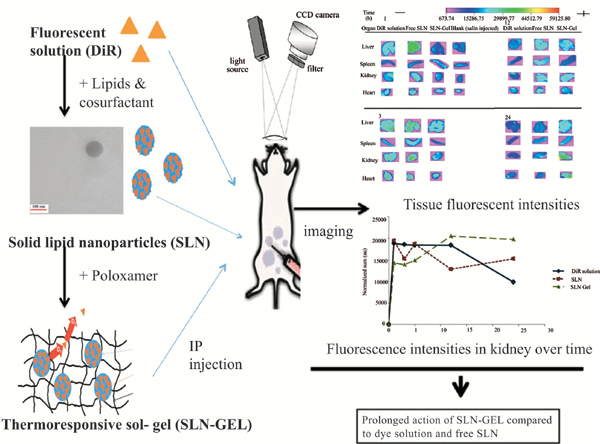 Biodistribution of DiR formulations (solution, free SLN and SLN-Gel) was investigated by whole-body and ex-vivo organ imaging after intraperitoneal injection in mice. SLN showed particle size of about 165 nm and a negative zeta potential of about -36 mV. Results: Leakage studies indicated that fluorescent probe does not release from SLNs. Imaging results revealed a steady profile for SLN-Gel over time, while the fluorescence intensity of solution and free SLN showed a burst followed by rapid clearance. Results also showed that SLN release occurs after gel erosion and follows a zero order profile. Conclusion: Our results indicate that NP-incorporated gel can be used to control the release of SLNs from application site and prolong their action in a sustained manner. Keywords: Controlled release, fluorescence reflectance imaging, in-situ forming gels, solid lipid nanoparticle, SLN, thermoresponsive, tissue imaging, whole-body imaging. Keywords:Controlled release, fluorescence reflectance imaging, in-situ forming gels, solid lipid nanoparticle, SLN, thermoresponsive, tissue imaging, whole-body imaging. Abstract:Background: Nanoparticles (NPs) suffer from rapid clearance from body and require frequent dosing if long treatment is required.